I knew whatever I had was a virus. So I didn’t go to the doctor on Saturday when I was aching, on Sunday when I being sick, on Monday when I was unable to move from the couch, on Tuesday when I had a temperature that would only stay down with paracetamol, or on Wednesday when I was still feeling like crap. I hate going to the doctor and paying €50 to be told “it’s a virus” which is doctor-speak for “you’re on your own.” Or “you’re on your own minus €50” to be more specific. But today when I couldn’t speak a full sentence without doubling over coughing, I realised that this pesky little virus has made its way to my chest so I’d best get myself to the doctor. He poked and prodded, and nodded knowingly, and he pronounced “It’s a virus. You’ll just have to weather it out.” Gah!!! Is a magic cure too much to expect for the princely cure of €50? Is it? In slightly related news, my fishes are also ill. We got a couple of friends to keep Freddie company in his new tank, and it seems one of them brought a parasite. Poor fishies. At least their treatment is interesting looking. 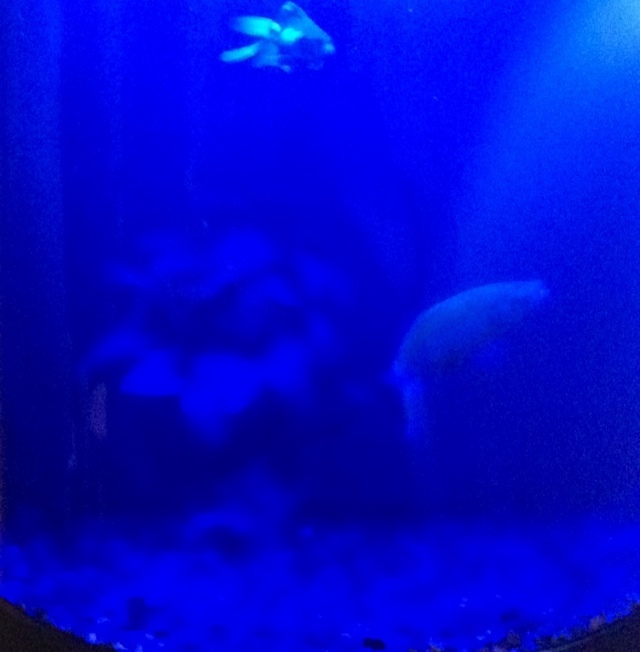 Check out our blue water tank! It sounds like your virus has now become an infection. Perhaps it is time to look for a new doctor.